Noël In Cité Soleil | HURAH! In spite of my plans for my first days in Haïti, Noël has taken front stage. Barely out of the airport after a two-hour delay on Friday by Spirit Air, I was whisked to the AUMOHD office to help with stuffing emergency packets for victims of Noël in Cité Soleil. We filled about 30 bags with canned goods, crackers, rice, and candles. AUMOHD workers were very candid about this being a drop in the bucket, but nonetheless a heartfelt outreach effort on these volunteer human rights workers part. I thought maybe that someone had donated the rice since the bags had American flags, and of course, the proud label, “American White Rice”. But no, this was purchased by AUMOHD, no donations. I hadn’t seen much detail about Noël’s impact on Haïti. It seemed to me that it had barely grazed the territory as it headed on to Canada-Nova Scotia. But AUMOHD was aware of tough times in a tough place like Cité Soleil. This vast flatland by the ocean is probably at sea level or even below in some spots. 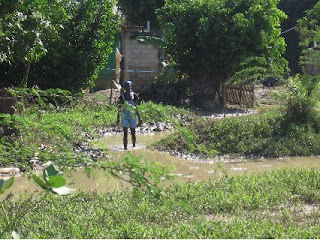 Flooding was the result, houses ruined, crops spoiled. Later in my third trip to the sprawling poverty ridden communities we learned that 2,800 persons have been housed in temporary shelter. Some 43 deaths in all have been registered in Haiti. I don’t have specifics for Cité Soleil. Since the ceasefire the whole place has opened up. I was astounded this weekend at the freedom to circulate in a place where I originally had to be escorted in by trusted people scrutinized by machine gun guards at strategic checkposts. I’ve been three times now and all the roads are open and the people circulate freely. I have to say that the people react cheerfully and friendly to our passing by their humble surroundings. Even if the promised money we read about in the papers from all quarters for relief for hurricane Noël victims were to actually arrive, there would still be problems. 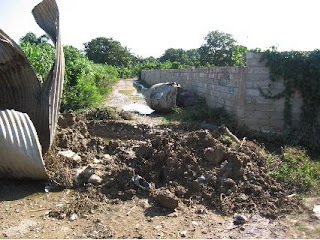 The problems of Haiti go back 200 years and no help, will be timely and adequate. So thanks again to AUMOHD and it’s HNVNPC partners we not only brought our token relief packages which were distributed with the utmost caring and fair way, but we held a meeting with reps from a half dozen communities. The problems were already diagnosed: no effective public awareness program, no organized distribution of relief, no preparation for preventive action regarding post-flooding disease control. AUMOHD President Fanfan hammered out plans for a general mobilization on Thursday when large groups would be gathered and public information would be shared especially information on how to purify water to protect young children first of all. AUMOHD is also collecting for economical water purification chemicals. 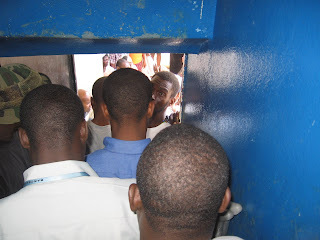 Today, Monday we again went to Cité Soleil and covered several of the hardest hit areas. As we ended up our whirlwind tour we found on trying to return that people had set up a roadblock partly in trying to keep the roads from being further eroded, but also in part to bring attention to everyone, especially people like ourselves, and the government vehicles (I noticed later that police and UN cars were headed in our direction). But because we had leaders from these same communities, we were greeted with applause and the roadblock was removed enough for us to get through. We told them we were headed to the city hall to meet with the officials. At city hall we were escorted ahead of long lines of citizens, briefly were seated in the mayor’s office (Mayor Gustave), and then whisked out of the building quickly to our cars and we were taken to another city hall building down the road and met for two hours with city officials. I saw Evel Fanfan, President of AUMOHD at his very best in this meeting. I have seen him working this way since we first met in April 2004. He has an unrelenting perseverance in his eyes and speech, and yet he always connects with his counterpart in strategic points with punctuations of laughter and mutual recognition of shared viewpoints. It is magical. 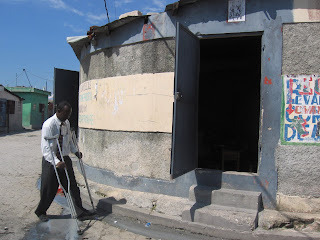 Pastor Doceus, the president of the Cité Soleil Community Human Rights Council, has the most wilting eyes and facial expressions as he grasps his crutches bringing his points across. 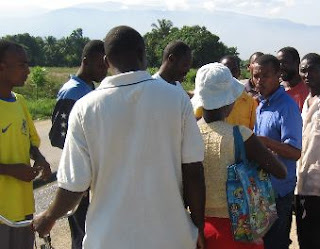 Mayor Gustave was consummately professional, speaking in almost a whisper the details his administration had collected and what he was doing to go into action. He asked for the group’s help. During the meeting he received several calls, one of which was from the Assistant to the UN representative, Madame Elizabeth. This woman had heard stories of mobs and gunshots where the assistant mayor was present. He assured her that this was not violent and was always under control. He gave the phone to Attorney Fanfan, known personally and respected by Madame Elizabeth and the two of them exchanged views productively. In the end it was clear that although the government was in charge, having the figures about the displaced and the needs of the victims, it was not capable of doing the job alone and depended on the services of the HNVNPC and AUMOHD to help with the mobilization and organizing of a community effort. AUMOHD and the community folks have been asking for a structure of community networks with communications infrastructure in place to deal with emergencies just like this as well as getting the communities organized for regular development. The 20million USD promised last winter as a result of the end of the hostilities has yet to be seen. We will be following up on this as well as the flood aid.